In Australia, chickpeas are grown by farmers from Queensland to Victoria and across the South to Western Australia, so many Australian farmers will be pleased with the news of a scientific breakthrough that promises improved grain yields and quality, greater drought tolerance and disease resistance, and enhanced genetic diversity for the humble chickpea, the second largest cultivated grain food legume in the world. The Crawford Fund was pleased to help spread the word to Australian farmers of the decoding of the genome of chickpea, a leading grain legume for many poor smallholder farmers, promising improved livelihoods in marginal environments. The global research team, led by the International Crops Research Institute for the Semi-Arid Tropics (ICRISAT) included Australian researchers at CSIRO and Curtin University, and was supported by the Grains Research and Development Corporation, and announced the breakthrough in Nature Biotechnology, the highest ranked journal in the area of biotechnology. The research milestone was the result of years of genome analysis by the International Chickpea Genome Sequencing Consortium (ICGSC) involving 49 scientists from 23 organizations in 10 countries. The global research partnership succeeded in identifying an estimated 28,269 genes of chickpea after sequencing CDC Frontier, a kabuli (large-seeded) chickpea variety. Re-sequencing of additional 90 genotypes provided millions of genetic markers and low diversity genome regions that may be used in the development of superior varieties with enhanced drought tolerance and disease resistance. This will help chickpea farmers become more resilient to emerging challenges brought about by the threat of climate change. The genome map can also be used to harness genetic diversity by broadening the genetic base of cultivated chickpea genepool. Chickpea is the second largest cultivated grain food legume in the world, grown in about 11.5 million hectares mostly by resource poor farmers in the semi-arid tropics. 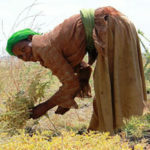 The highly nutritious, drought-tolerant chickpea contributes to income generation and improved livelihoods of smallholder farmers in African countries like Ethiopia, Tanzania and Kenya, and is crucial to the food security in India (being the largest producer, consumer and importer of the crop). Chickpea is also an important component of the pulse industry in Australia, Canada and USA. 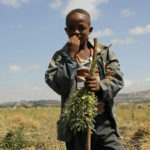 “In the face of the growing global hunger and poverty amid the threat of climate change, the chickpea genome sequence will facilitate the development of superior varieties that will generate more income and help extricate vulnerable dryland communities out of poverty and hunger for good, particularly those in the drylands of Asia and sub-Africa for whom ICRISAT and our partners are working,” Dr Dar adds. “Genetic diversity, an important prerequisite for crop improvement, is very limited and has been a serious constraint for chickpea improvement. This study will provide not only access to ‘good genes’ to speed up breeding, but also to genomic regions that will bring genetic diversity back from landraces or wild species to breeding lines,” explains Dr Rajeev Varshney, coordinator of ICGSC and Director – Center of Excellence in Genomics, ICRISAT. “At the moment, it takes 4-8 years to breed a new chickpea variety. This genome sequence could reduce to half the time to breed for a new variety with market-preferred traits.” he adds. According to Professor Jun Wang, Director of the Beijing Genomics Institute (BGI), “The collaboration between BGI and ICRISAT has yielded significant achievements in orphan crops research, like the pigeonpea genome before and now, the chickpea genome. I believe that our partnership will revolutionize research on orphan crops, which are key staple crops in many low-income countries and are extremely important to smallholder farmers worldwide. “The importance of this new resource for chickpea improvement cannot be overstated. 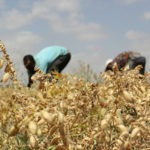 This genome sequence will provide the basis for a wide range of studies, from the important goal of accelerated breeding, to identifying the molecular basis of a range of key agronomic traits, to basic studies of chickpea biology,” says Professor Doug Cook from the University of California-Davis, USA. 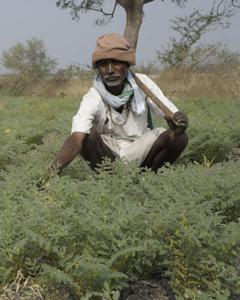 “Making the chickpea genome available to the global research community is an important milestone in bringing chickpea improvement into the 21st century to address nutritional security of the poor – especially the rural poor in South Asia. We look forward to seeing how researchers around the globe will harness this resource to increase chickpea productivity against the backdrop of climate change in the developing world,” according to Dr David Bergvinson, Senior Programme Manager, Science & Technology, Global Development, Bill & Melinda Gates Foundation. 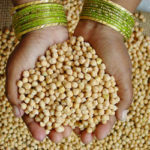 The chickpea genome sequencing project was undertaken by the ICGSC led by ICRISAT, the University of California-Davis (USA) and the Beijing Genome Institute (BGI)-Shenzhen (China) with key involvement of national partners in India, USA, Canada, Spain, Australia, Germany and Czech Republic. The initiative was funded by the Generation Challenge Programme (CGIAR), US National Science Foundation (NSF), Saskatchewan Pulse Growers (Canada), Grains Resource Development Corporation (Australia), Indo-German Science Technology Corporation (Germany and India), National Institute for Agricultural and Food Research and Technology (Spain), National Research Initiative of US Department of Agriculture’s National Institute of Food and Agriculture (USA), Ministry of Education, Youth and Sports of the Czech Republic and the European Regional Development Fund, University of Cordoba, ICAR (India), BGI (China) and ICRISAT.